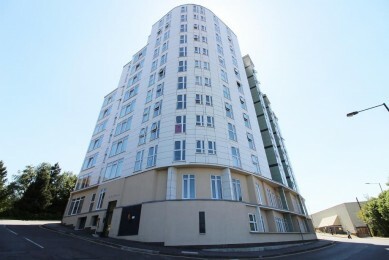 **No onward chain** Gates Estates are excited to offer this beautifully presented, seventh floor, spacious, 1 bedroom apartment. It is located in the ever popular Skyline apartments and boasts easy access to Schools, Pubs, Restaurants, Supermarkets and shops. The living room is a very generous size and boasts beautiful windows allowing ample natural light to come flooding in. It has ample space for a dining table towards the kitchen. The walls are painted magnolia and boasts wood effect flooring. The kitchen is a very good size and has ample storage. The kitchen units are extremely modern and have ample storage space. There is an electric cooker and hob. An extractor fan is present above the cooker. The flooring is wood effect vinyl and the walls are painted white. This bedroom is a very large double. It has a large window with double glazing. The walls are painted white and there is wood effect flooring. Spacious bathroom located near the front door. It has a three piece, white toilet sweet including Toilet, wash basin and shower over the bath.